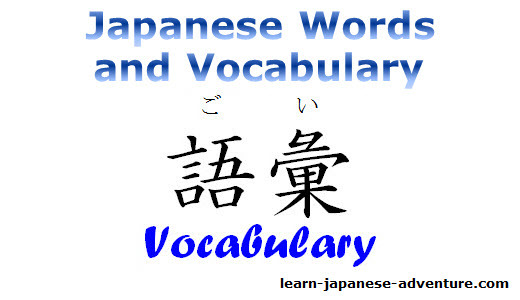 Build up your knowledge on Japanese words and vocabulary. This can really speed up your Japanese learning process. I can't stress more on the importance of doing the above. Sometimes you will get bored on studying grammar alone. While I don't deny the importance of grammar, increasing your "word inventory" is equally important as well. When I was studying my Japanese courses, my teacher gave us separate Japanese word lists containing vocabulary related to that particular lesson. Throughout the years of my studies, these stack of vocabulary lists have not only helped me to enrich my knowledge in Japanese words, they have also strengthened my Japanese studies. 1. You tend to speak more fluently with a rich set of Japanese vocabulary in your bag. Hence it will encourage you to speak to people voluntarily. 2. More words also means more quality contents in what you write and therefore easier for you to communicate through writing Japanese. 3. You will get to comprehend faster on the articles in JLPT or in other Japanese documents. That can save you plenty of time. How to Increase Your Japanese Vocabulary? Believe it or not, you really can learn and increase your vocabulary by listening to your favorite Japanese songs. Probably the reason is that when you keep listening to the songs over and over, somehow the lyrics just got into your head subconsciously. And by that your knowledge of words increased after a period of time, without even you knowing. Naturally, if you keep watching more dramas, your ears become so used to the language. In no time, before you can notice, you have picked up certain amount of new words and you remembered these words related to the scenes in the dramas. In fact I think this is the best way to learn new words without forcing yourself to remember. Didn't we do the same thing when are learning our mother tongue? This is the universal "rule" to increase one's word list when learning any new language. You will come across many new vocabulary you normally won't find in the textbooks or notes when learning Japanese. You will also discover how some words are used differently as opposed to what you were taught in the classroom. Learn how animals are called in Japanese with hiragana, katakana, romaji and kanji given. Learn what are the various terms used in Japanese banks and Automatic Teller Machine (ATM). Study the vocabulary for various Japanese body parts, from head to toe. Also learn how to describe the body parts correctly. Familiarize the names of common Japanese buildings and places which can be helpful when you are traveling in Japan. See the Japanese word list that contains the names for Japanese clothes and accessories. Learn the names of various Japanese colors to enrich your vocabulary. Find out how your own country is written and pronounced in Japanese. Discover the various Japanese drinks sell in the convenience stores and vending machines. There are two different ways of calling the Japanese family members, your own family members and someone's family members. Get to know the various Japanese festivals and events that native Japanese are celebrating, especially their unique matsuri. Japanese food is not only sushi or tempura. There are plenty of other delicious Japanese dishes. Find out more here. Learn these common Japanese words for fruits, how they are written and pronounced. Many of them in are written katakana. Find out what are the things you can see in a typical Japanese house. What are the names in Japanese? Check out here for more. Increase your vocabulary on Japanese nature words. Learn what volcano, forest, and etc are called in Japanese. Check out the various names for different Japanese occupations and jobs you can find in Japan, including some related terms. Acquire the Japanese words and vocabulary commonly used in things related to a typical Japanese office. Wonder what are all the words and vocabulary related to Japanese schools. Check out the word list here. Find out more about the different names of Japanese shop and store. They can be useful when you visit Japan next time. Identify the words used in Japanese signs and signboards so that your won't get lost during your next trip in Japan. The Japanese sports word list here includes words for traditional Japanese sports and those 'borrowed' from foreign countries in katakana. Study the vocabulary list on Japanese trains and stations so that you don't get overwhelmed by the complicated train network. Increase your vocabulary of these Japanese travel words so that you know what are their names when you travel to Japan next time. Grasp the Japanese words used to describe Japanese weather to get what's the weathercaster talking about. Study this list for the most common vocabulary for Japanese adjectives for those studying the basics.